The most perfect wine glasses! Indulge yourself with the best wine glass money can buy. Designed by Tom Nybroe for Holmegaard, the glass division of Royal Scandinavia. The Perfection range has been created for wine aficionados who want well-thought-out functionality right down to the smallest detail. Perfection was truly designed for the wine. Any grape and and any wine should be able to unfold perfectly in the generous design of the series. 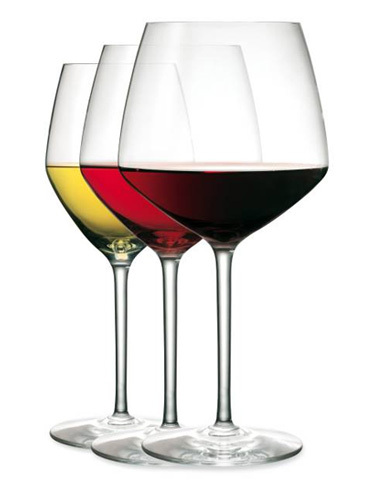 The classic wine glass was fused with a new and innovative expression which nutures the wine. The large surface lets the wine readily unfold. The distinctive pour line helps correct and uniform dosage. And the design is so harmonious and pleasant to drink from that all senses will celebrate. We now have samples to try in our showroom. Established in 1825, Holmegaard is famous for its high standards in tableware glass. The lines are completely pure and the idiom is refined.